Link to Craftsman and Wolves website here. Link to previous post on Craftsman and Wolves here. I really liked AQ, a fine dining restaurant in San Francisco run by Chef Mark Liberman that changes its menu as well as its decor each season. The tasting menu is delicious, highlights local and seasonal ingredients, exhibits the chefs’ technical expertise (without being only about technique), and is not unreasonably priced (relative to other restaurants in San Francisco). One outstanding dish among many was the rainbow trout, seared on one side to make the skin crispy while keeping the fillet perfectly cooked. It was served with a smoked trout cream, potatoes, and a swiss chard “jam” with pickled swiss chard ribs. Well-balanced and delicious. The braised root vegetable was really transformed by braising in red wine. It is paired with a cassoulet of boar confit, beans, and a sweet prune jam. 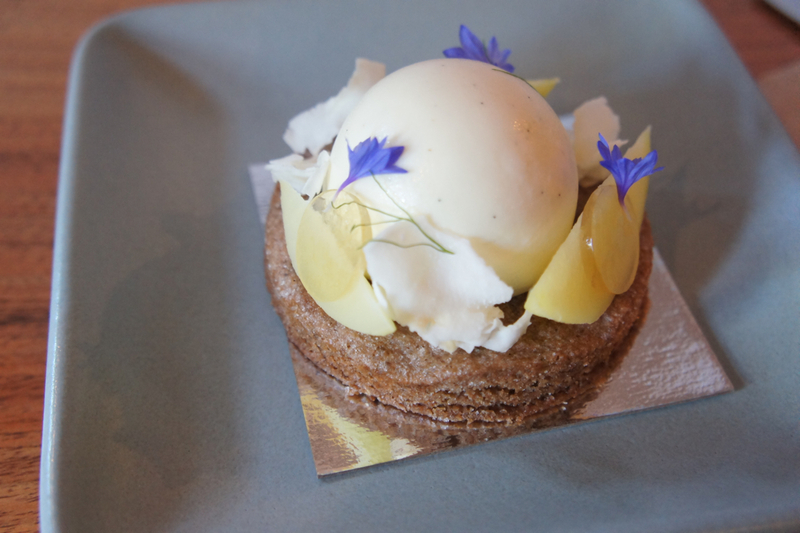 The desserts are unique and creative, including a sorbet that tasted of pure apple and a dessert that straddled the line between sweet and savory, with thyme, olive oil, and olives. One disappointment was the truffle supplement. Three slices of shaved truffle that did not add much flavor or aroma to an otherwise great dish of black walnuts, wheat berries, and oats in an aromatic mushroom broth. Service was very professional, and they even kindly sent out a complimentary chocolate birthday cake. Chef Liberman was expediting at the pass in front of an open kitchen and brought over and explained several of the dishes and answered questions. Overall an excellent meal in an elegant setting with outstanding service. Definitely recommended. On a side note, over the past several years, many menus are being written in a style where a dish is not described in terms of preparation but simply as a list of ingredients. This style puts the focus on the ingredients and de-emphasizes technique, but often leaves the diner puzzled about what they are actually going to get when the food arrives. I kind of want to know what I am going to get, but on the other hand some people like being surprised. Link to AQ web site here. 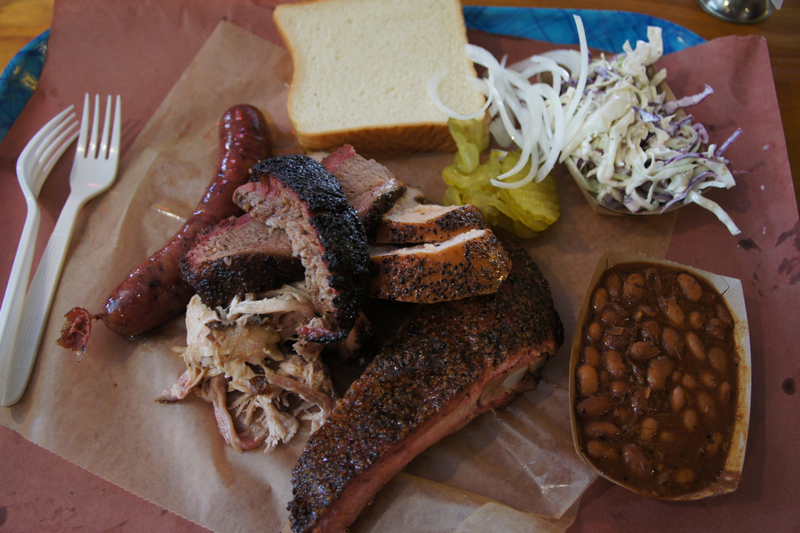 Franklin Barbecue started off as a food truck in 2009 and has morphed into a stand-alone restaurant that is enormously popular. It has gotten a lot of press, to say the least. The brisket was hyperbolically named best in the history of the world in 2011 by The Austin Chronicle (come to think of it, coming from a Texas publication, this might be true), and the same year Bon Appetit magazine declared Franklin the best barbecue in America. Recently, Franklin has even been featured in a national Chase Sapphire Preferred commercial with Chef Aaron Franklin being visited by Chef Nobu Matsuhisa. All of the buzz has resulted in lengthy waits. People start lining up before 8am for the 11am opening time. This is to get a coveted place under the covered awning on one side of the building to help escape the relentless, scorching Texas sun and heat (100 degrees when I visited in early September), and to ensure that the barbecue does not sell out. I arrived on a Sunday morning at 8am, and was about 20th in line and got a place under the awning. I finally made it inside after a three hour wait. Thankfully, Franklin’s restaurant is air-conditioned! Franklin serves beef brisket, pork ribs, pulled pork, turkey, and sausage. I got a ¼ pound sampler platter of each type of meat, along with one sausage link. At the counter I got my first taste of the brisket, a generous sample cut by the chef. Crisp bark, fatty richness, moist interior, and smoky flavor throughout really was extraordinary. There are fatty and lean portions available, and I think the fatty portions are the best, but they are both great. The pork rib was also outstanding. Peppery bark, with tender flavorful interior meat. The sausage was also excellent. The turkey was moist and good, and the pulled pork was fair. The stand-outs for me were that brisket, along with the pork rib and sausage. Pickles are essential to cut the richness of all the meat. Their cole slaw is really great, and the beans were OK in my opinion. I got a pound of brisket to take home. They wrap it in butcher paper and provide a plastic bag and some containers of three types of BBQ sauce. Everyone was really friendly. The brisket survived a plane trip home the same day and was delicious wrapped in foil and reheated at 350 for about twenty minutes. This is the last in my series on Austin, a city I really liked. Unique places like Franklin Barbecue, Qui, John Mueller, and East Side King make Austin a really great food destination. Link to Franklin Barbecue website here. Chef Paul Qui won Top Chef season 9 and displayed a lot of creativity and generated a ton of praise from the judges. He was previously chef at Uchiko in Austin, having worked with Chef Tyson Cole. In June 2013 he opened his eponymous restaurant Qui, an alien spaceship of fine dining among the dive bars, beer gardens, live music clubs, and food trucks along E. 6th street in East Austin. Qui does not take reservations, so I had about an hour wait on a Saturday evening for a seat overlooking Qui’s open kitchen. There is a nice bar and outside seating area to wait, and one can also wander around the eclectic 6th street neighborhood. The meal starts with an amuse consisting of a cheese foam on a nori cracker. Food photographers take note: the cheese foam loses body quickly, so be ready. Also, bring a fast lens or do some stacking, because the lighting is dim in this restaurant. The Marcona Almond Gazpacho with Foie Gras was truly extraordinary, seriously may be the best thing I ever ate. I have had foie a few times, and when it is served in large pieces I find it just a bit too much. Here, they shaved slices of foie over the chilled soup, and the resulting thin shavings melt and combine with the gazpacho into a luxurious creaminess that was incredible. There was crunch and flavor of the Marcona almonds, and sweetness from a few cubes of cherry gelee. A really amazing dish. I also had the chawanmushi, one of Chef Qui’s winning dishes from Top Chef. This evening it was made with ham broth (instead of traditional dashi broth), and served with pieces of country ham, a seared filet of bass, seared hash brown, salsa verde, and topped with caviar. There is a lot going on here texturally and flavor-wise, and it really works well together. In the main course portion of the menu there is a Salt and Time section featuring butcher’s cuts for the day. I had a pork sopreto, a pork steak served with mashed potatoes and house kimchi. This was the only misfire of the day for me. I didn’t finish, wanting to leave room for dessert. The waiter noticed this and actually comped the dish, which was very generous. The “Qui” Lime Pie is an avocado mouse, topped with key lime ice cream and sweet meringue, all on a crunch base. This dessert was a real winner, with a great combination of flavors and textures. The Cheddar Cheese Ice Cream Sandwich had cheese ice cream sandwiched by thin waffles, with shaved cheddar on top. This was good and interesting, but I favored the Qui Lime Pie among the two. Chef Qui was there in the kitchen, mentoring his staff and working the line. Qui is an ambitious endeavor and in my opinion quite impressive in the adventurousness and deliciousness of the menu, the great attention to detail, professionalism of the staff, design of the restaurant, and overall experience. Highly recommended. Link to Qui Restaurant website here.